A laser is defined as an optical device which emits a beam of light radiation. 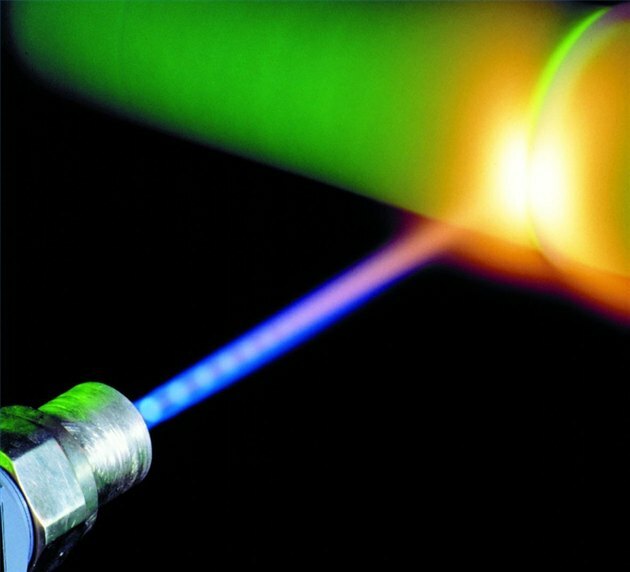 Unlike light from other natural and artificial sources, a laser is monochromatic, meaning it only casts light of a very specific wavelength. If the wavelength were in the visible spectrum the laser would appear as a certain color. As lasers have been developed they've found uses besides the purely academic fields. They're commonly used to read the contents of CDs and DVDs. Extremely powerful lasers are used to cut through metals in heavy industry or etch patterns and designs into hard surfaces. Small and precise lasers are used in surgery to cut tissue and cauterize blood-flow. They also have military applications as range-finders and targeting devices. As a fun experiment and a cheap alternative to purchasing your own commercially produced laser, here is a guide to building your own laser. Take the positive and negative leads running from the Triple A Battery Holder and press them against the corresponding points on the switch. Press your soldering wire to the leads and melt the solder in place with the soldering iron. Set this aside. Solder the 100ohm POT to the 16X Laser Diode. There will be three points on the back of the diode in a triangle pattern. The 100ohm POT will connect to the one top or outside point on the back of the diode. This will help regulate the flow of electricity through the diode to create an actual laser rather than a constant Light Emitting Diode. Connect two lengths of copper wiring to the remaining contact points and solder them into place. The other ends of the wire should be soldered to the two remaining points on the back of the 16X Laser Diode. There should be a screw on the side of the POT which alters the resistance it creates. use your screwdriver to set it to put out maximum resistance. Insert two Triple A Batteries into the holder and turn on the device. Watch the diode and slowly lower the level of resistance on the POT. Stop when the diode is at its brightest. Turn off the device. Slip the diode in the Top Half of The Axis Module. This Module looks a bit like the head of a flashlight. Essentially it is a metal cylinder containing a number of focusing lenses. The appropriate focusing of a laser is and always has been the most difficult part of building one and it's a little too sophisticated for someone without a degree in Physics, specializing in Optics, and in possession of a fully functional optical laboratory. So it's best to go with a store-bought lens. Seat the diode inside the Module at a very specific distance from the lens. If the lens is far from the diode, you will create a harmless laser pointer. if the lens is right up against the diode you will create a laser capable of burning skin, setting paper alight, melting plastic, and charring wood. Decide which of the laser types you wish to create and apply a few pieces of solder to the back of the diode, where it touches against the inside of the Module, to hold the device in place. Fit the whole device to slide down the inside of a cardboard tube such as you would get from a paper towel roll or toilet paper. With the front of the Module peeking out of the tube, tape it firmly into place. Cut the tube short enough that the switch protrudes out the back. Tape the switch into place. You now have a homemade laser that's just as effective as any you could buy commercially.